National Financial Aid Day on Oct. 19 celebrates and recognizes the contribution of all financial aid professionals across the United States for helping students realize their college dreams and for being so ever effective at helping our institutions accomplish their mission. Please come and celebrate with the Office of Financial Aid on Wednesday, Oct. 19, from 1-3 p.m. in Webster Hall, Room 115. There will be cookies and a free drawing for a lunch with four of the Financial Aid team at Cyrano’s. What is National Financial Aid Day? Millions of college students across the nation rely on and benefit from federal, state, and institutional financial aid programs. Given the increasing cost of tuition and state of the nation’s economy, financial aid applicants are on the rise. 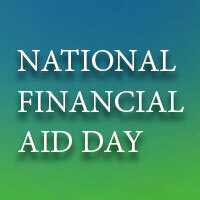 In 2011, The United States Congress recognized the third Wednesday in October as National Financial Aid Day.